Federal budget deficits currently are unusually high, but Social Security bears no responsibility for today’s shortfalls. Keep in mind that the federal government was experiencing budget surpluses at the end of the 1990s, but those quickly were transformed into deficits early in the 2000s because of large tax cuts and increased governmental spending on the wars in Iraq and Afghanistan, as well as homeland security. The nation’s fiscal situation worsened when the recent economic downturn caused federal revenues to collapse along with taxable incomes and profits, greatly widening budget deficits. Because Social Security continued to collect hundreds of billions of dollars more from payroll taxes than it spent on benefits throughout the decade, however, the program actually reduced overall federal budget deficits far below what they otherwise would have been. 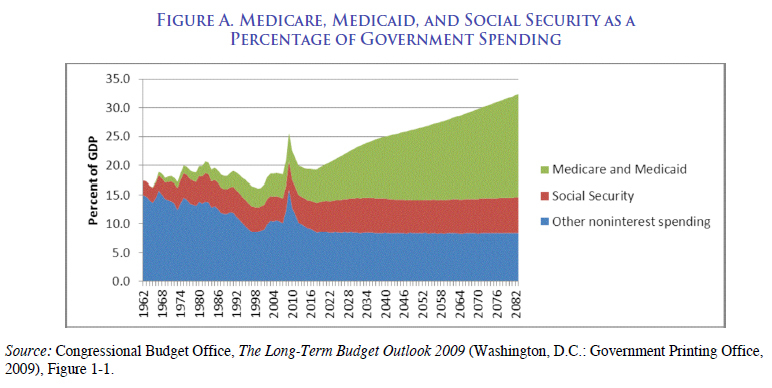 As the graph above shows, the dominant cause of the projected long-term debt problem is not Social Security, nor short-term deficit spending to aid economic recovery, but rather the expectation that health care costs will continue to rise much more rapidly than overall inflation. Projections show that combined Medicare and Medicaid outlays for the federal government will double, from about 5 percent of gross domestic product (GDP) today to about 10 percent by 2030. Social Security’s expected growth is expected to be far more modest, and much more manageable, gradually rising from the same 5 percent of GDP today to about 6 percent by 2030, as the Baby Boom generation retires. Throughout that period, the revenues dedicated to the program from payroll taxes and commitments from its large and growing trust funds will be more than sufficient to pay benefits in full until around 2037. At that point, if nothing is done, benefits would have to decline by about a fifth. But even if the Trust Fund is exhausted in 2037, payroll taxes alone at the current level would cover benefits averaging $19,300 ‐‐ about $1,600 more than today’s typical retiree receives (after inflation).